West Jakarta Empowerment of Child Protection and Population Control (PPAPP) Sub-dept. 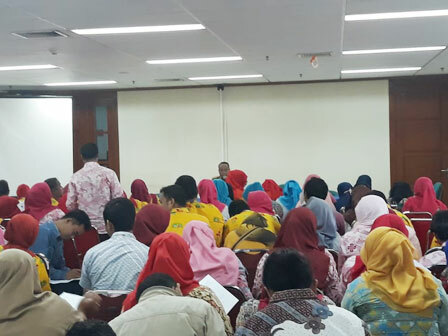 is cooperating with Jakarta National Narcotics Agency (BNN), Tuesday (4/17) to hold urine test towards 12 out of 336 RPTRA caretakers in West Jakarta.
" In the near future, we will do the same thing for 224 other RPTRA caretakers"
West Jakarta PPAPP Sub-dept. Head, Endang Widaningsih said, it is done to ensure RPTRA caretakers free from drugs. "Alhamdulillah (Thank God), 112 RPTRA caretakers are positive free from drugs. In the near future, we will do the same thing for 224 other RPTRA caretakers," she expressed. She asserted every RPTRA caretakers must be clean of drug use, as their duty is to serve people, ranging from children until elderly. He added socialization about danger of drugs is also given to those who want to undergo urine test. "As a result, when they are on duty, they can find out the visitors suspected drug users and drug dealers in RPTRA," she stated.